The economic climate has not deterred developers from planning multi-billion ringgit projects in Penang. The general consensus is that the current slow period is part of the property cycle and not something sinister like the 1997/98 Asian Financial Crisis. In time, the situation will turn around and they are preparing for the cycle to turn. Among some of these positive thinkers are SP Setia Bhd, Eco World Development Group Bhd, Hunza Properties Bhd, Ideal Property Development Sdn Bhd and Aspen Vision All Sdn Bhd. These companies are planning multi-billion ringgit schemes for launch in the near future. Among the larger players, SP Setia general manager Ng Han Seong says in 2017, the group will focus on a new project in Bertam which will have a gross development value (GDV) of RM9.6bil. “This is the group’s biggest project in Penang. It will take 15 to 20 years to complete the entire scheme which will comprise hotels, shoplots, high-rise residentials on a 1,600-acre site. “The masterplan will be finalised in six months,” Ng said. On the new higher density guidelines, Ng says the group would not launch fresh projects under this new guidelines on the island this year. To recap, the local authorities had recently increased the density per acre to 128 units from the previous 87 units. “We launched a condominium project known as Setia Sky Ville in Jelutong, and Isle of Palm, a landed property scheme in Sungai Ara, last year. Both the Isle of Palm and Setia Sky Ville projects are 40% and 50% sold respectively. Over at Eco World Development Group, general manager Khoo Teck Chong says the group is focusing on the RM8bil Eco Horizon and Eco Sun projects in Batu Kawan on a 374-acre site later this year. “We are seeking approval from the local authorities. We will reassess market conditions again next year before making plans for projects on the island under the new density guidelines,” he says. The group will focus on its ongoing Eco Terraces project in Paya Terubong for 2017. Hunza Properties Bhd plans to develop the RM8bil Penang International Commercial City (PICC). The mixed development project comprises condominiums and serviced apartments, a mall and other retail outlets, hotels, a business process outsourcing (BPO) tower and a medical centre. The PICC project will be developed over a 10-year period on 43.35 acres (17.5ha) site in Bayan Baru, according to Hunza managing director Datuk Khor Siang Gin. Ideal Property executive chairman Datuk Alex Ooi says among the biggest project the group plans to undertake this year is the RM2.4bil mixed development project on Pulau Jerejak. “The group is also planning the RM520mil Imperial Grande in Bayan Lepas, a RM300mil condominium development known as The Rain in Sungai Ara, the RM486mil Queens Residence 2 at Persiaran Bayan Bay Indah, and a RM1.4bil landed property scheme in Balik Pulau. “These projects will be developed over a five-year period till 2022,” Ooi says. Aspen Vision All Sdn Bhd chief executive officer Datuk M. Murly says the group plans to launch the Vertu Resort and Vittoria Financial Centre in Batu Kawan this year. Other projects to be unveiled this year include Beacon Executive Suites in Sungai Pinang and the HH Residence in Tanjung Bungah. All three projects have a total GDV of RM2.1bil, Murly says. Before planning for higher density projects under the new density guidelines, the group will determine whether the state plans to impose additional contribution for projects under the new policy, says Murly. “All our existing developments are submitted based on old guidelines. Mah Sing Group Bhd senior chief operating officer Seth Lim says that the group will plan new projects based on its remaining land bank in Penang. The group has a land bank of 83 acres with a GDV of RM2.8bil in Penang as at Sept 30, 2016. “We are currently reviewing the new guidelines and how to best implement them in future launches. The increase in density will enable developers to have better land use by reducing the cost per unit. This will improve affordability,” he says. IJM Land Bhd senior general manager Datuk Toh Chin Leong says the group is not planning fresh projects based on the new density guidelines on the island this year. “We will assess the market situation before making plans for higher density projects,” Toh adds. Toh, who is Real Estate & Housing Developers Association (Rehda, Penang) chairman, says developers in Penang are now exploring how to best implement projects under the new density guidelines. “The additional 41 units per acre allows the developer to build more 600 sq ft to 700 sq ft units. 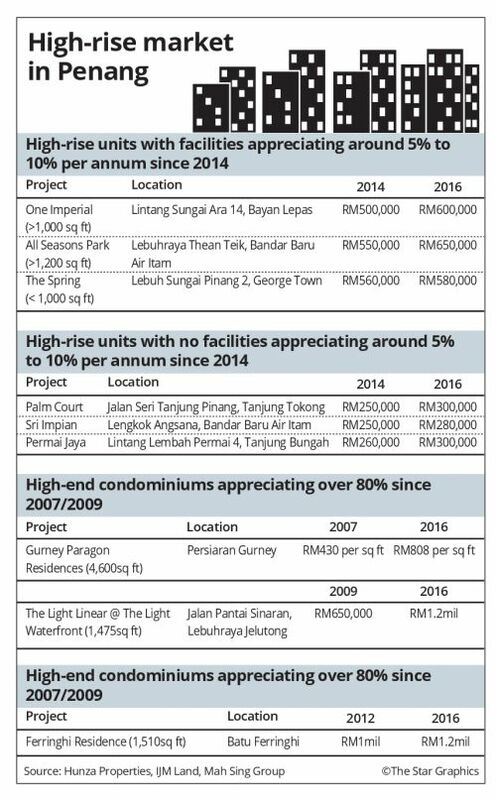 The pricing for these properties is over RM400,000. “Under the old guideline, developers, due to the lower density of 87 units per acre, have to focus on building larger units of 1,000 to 1,400 sq ft to sell at a higher price to generate a reasonable margin. “If they build more smaller size units with a lower selling price under the old guideline, they would not be able to generate a decent margin,” Toh says. Property prices are expected to remain stable due to excess supply and the difficulty in obtaining bank loans. “The soon-to-be-implemented measure requiring purchasers to pay upfront the stamp duty upon the signing of sales and purchase agreement is likely to dampen property transactions. “The stamp duty, which is usually above 2% of the purchase price, is normally paid after the project has been completed. “We expect developers to price their products even more competitively once the measure is implemented,” Toh says. On the Penang Transport Master Plan (PTMP) and its impact on the property market, Raine & Horne Malaysia senior partner Michael Geh says the plan will only materialise if the federal government approves PTMP’s reclamation plans.